Science For All - Ciência para Todos: T54. Josiah Willard Gibbs by Paulo Netz, Chemistry Institute, Federal University of Rio Grande do Sul, RS, Brazil. T54. Josiah Willard Gibbs by Paulo Netz, Chemistry Institute, Federal University of Rio Grande do Sul, RS, Brazil. Thermodynamics grew out of concerns related to heat engines, and has founders such as Thompson, Dalton, Fourier, Mayer, Helmholtz, Joule, Clausius, Carnot and Maxwell. 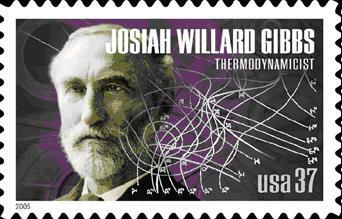 Chemical thermodynamics, however, owes its existence primarily to the enormous contribution of a great scientist: Josiah Willard Gibbs. Gibbs was born in New Haven, New England, in 1839. His father, also named Josiah Willard Gibbs, was a professor of theology, sacred literature and linguistics at Yale College, and took part in the episode of the Spanish ship "Amistad", illegally transporting African slaves. Gibbs father learned the rudiments of the language of slaves, which allowed him to seek former slaves to serve as interpreters for the mutineers. One of the mottos of Gibbs father was "Language is a template for the human mind". The obsession to seek the language that served as a template was central in young Gibbs’ efforts to build the foundations of chemical thermodynamics. Introverted and not very sociable, Gibbs stood out academically and graduated from Yale College in 1858, and joined The Connecticut Academy of Arts and Sciences. During the American Civil War from 1861 until 1865, Gibbs developed his doctoral work (the first doctorate in engineering in the United States) on the shape of the teeth on gears. In 1866, Gibbs studied in Paris, Berlin and Heidelberg with scientists like Liouville, Kronecker, Weierstrass and, above all, Helmholtz. For three years, Gibbs shared discussions about energy and thermodynamics, which marked this era in the scientific field. In 1869, at the age of 30, Gibbs returned to New Haven bringing in intellectual freedom, curiosity and mathematical rigor. At Yale, Gibbs began working as a professor of mathematical physics (without a salary until 1880) and was able to dedicate himself to science. In 1873, he published the article "Graphical Methods in the Thermodynamic of Fluids" in which he proposed entropy versus temperature diagrams, highlighting the centrality of the second law of thermodynamics. 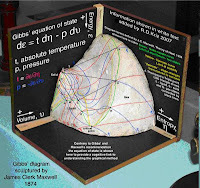 In a second article, in the same year, "A Method of Geometrical Representation of the Thermodynamic Properties of Substances by Means of Surfaces", Gibbs uses a three-dimensional surface whose variables are energy - volume - entropy. Such representation allowed him to discuss the idea of available energy and make way for the foundations of stability theory. This article caught Maxwell’s attention, in Europe, whose enthusiasm was such that he made a sculpture in plaster, representing the surface energy - volume - entropy for a substance with similar characteristics to those of water. In these two articles, thermodynamics evolves from a science connected with mechanics to a science connected with the states of material systems and their changes. In 1874 Gibbs presents to the Connecticut Academy of Science an outline of a new, ambitious work, which nobody could understand. Yet, in 1876, the Academy funded the publication of that which is considered to be the greatest work of Gibbs: a magnificent article of 300 pages and 700 equations, entitled "On the equilibrium of heterogeneous substances". In it, Gibbs discusses the properties of a "system" and its equilibrium conditions. Gibbs sought to extract the maximum knowledge one can have about a system, independently of its nature. This is a mark of Gibbs: as few hypotheses as possible, as many conclusions as possible, from generalizations of partial knowledge. Gibbs goes beyond the description of isolated or closed systems. He argues homogeneous and heterogeneous systems and introduces the central concept of chemical thermodynamics: the concept of chemical potential. Gibbs describes the chemical potential as an amount which, through transformations and chemical equilibrium, behaves similarly to temperature in changes and in thermal equilibrium, or yet similar to that of pressure in gross movements of the system and in mechanical equilibrium. As the heat spontaneously transfers from a portion of the system with higher temperature to another with lower temperature, the material moves spontaneously from a portion of the system with a higher chemical potential to a portion with a lower chemical potential. This concept allowed Gibbs to quantitatively describe the coexistence of phases of matter, phase equilibrium in simple substances and mixtures, thermodynamics of chemical reactions, limits of stability of the system, critical state, equilibrium of solids under tension, phenomena of interface and capillarity, and equilibrium in the presence of electromotive force. The great 1876 article by Gibbs provides the basis and the appropriate language for all the later formulations of chemical thermodynamics which can be found in current textbooks of physical chemistry. Despite its fundamental importance, Gibbs’ work had little immediate recognition. In Europe, he received acknowledgement thanks to the efforts of Maxwell in England, Ostwald in Germany, and Le Chatelier in France. Gradually, however, Gibbs also gained financial recognition (he went on to receive a salary in 1880). In the 1880s, Gibbs strongly focused his interest on mathematics and was responsible for the current vector calculus notation. In the subsequent decade, his efforts led to the construction of the foundations of statistical thermodynamics, a science that explains the macroscopic properties of material systems based on the microscopic level. The formulation of statistical thermodynamics disregards detailed hypotheses of the microscopic nature of matter. It is based on the statistical description of a huge number of independent systems - called ensemble. In Gibbs’ formulation, the whole turns out to be simpler than its parts, and the average behavior of ensembles is related to Macroscopic Thermodynamics. Gibbs' scientific career was interrupted by his death in 1903. His theoretical contributions and new concepts in physical chemistry have resulted in numerous applications - from metallurgy to biophysics, geology, chemical industry, pharmaceutical technology, nanotechnology, electrochemistry, among many others. Nothing fairer than a memorable quote from Gibbs, in his obituary, as he spoke of Rudolf Clausius: "His true monument lies not on the shelves of libraries, but in the thoughts of men, and in the history of more than one science". Josiah Willard Gibbs por Paulo Netz, Instituto de Química, UFRGS, Brasil. A termodinâmica nasceu de preocupações relacionadas às máquinas térmicas e, possui pais como Thompson, Dalton, Fourier, Mayer, Helmholtz, Joule, Clausius, Carnot e Maxwell. A termodinâmica química, porém, deve sua existência, fundamentalmente, à imensa contribuição de um grande cientista, Josiah Willard Gibbs. Gibbs nasceu em New Haven, Nova Inglaterra, em 1839. Seu pai, também chamado Josiah Willard Gibbs, era professor de teologia, literatura sacra e lingüística em Yale, e participou no episódio do navio espanhol “Amistad”, que transportava ilegalmente escravos africanos. Gibbs pai, aprendeu rudimentos da língua dos escravos, que permitiram buscar ex-escravos que serviram de intérpretes aos amotinados. Um dos lemas de Gibbs pai era “A linguagem é um molde para a mente humana”. Esta obsessão em buscar a linguagem que serve de molde foi central nos esforços do jovem Gibbs, para construir os alicerces da termodinâmica química. Introvertido e com dificuldades de relacionamento, Gibbs logo se destacou academicamente e, graduado em 1858, entrou para a academia de Artes e Ciências de Connecticut. Durante a Guerra Civil Norte-americana, de 1861 até 1865, Gibbs desenvolveu seu trabalho de doutorado (o primeiro doutorado em engenharia nos Estados Unidos) sobre a forma dos dentes nas engrenagens. Em 1866, Gibbs estudou em Paris, Berlim e Heidelberg com cientistas como Liouville, Kronecker, Weierstrass e, sobretudo, Helmholtz. Durante três anos, Gibbs partilhou das discussões a respeito da energia e da termodinâmica, que marcaram esta época no cenário científico. Em 1869, com 30 anos, Gibbs retornou a New Haven trazendo na bagagem liberdade intelectual, curiosidade e rigor matemático. Em Yale, Gibbs começou a atuar como professor de física matemática (sem salário até 1880), e pode se dedicar à ciência. Em 1873, publicou o artigo “Graphical Methods in the Thermodynamic of Fluids”, no qual propõe diagramas da entropia versus temperatura e, destaca a centralidade do segundo princípio da termodinâmica. No segundo artigo deste ano, “A Method of Geometrical Representation of the Thermodynamic Properties of Substances by Means of Surfaces”, Gibbs utiliza uma superfície tridimensional que tem como variáveis energia – volume – entropia. Com esta representação, Gibbs pode discutir a idéia de Energia disponível e iniciar os fundamentos da teoria da estabilidade. Este artigo chamou a atenção de Maxwell, na Europa e, o entusiasmo de Maxwell foi tanto que ele próprio moldou, em gesso, uma escultura representando uma superfície energia – volume – entropia para uma substância de características similares às da água. Nestes dois artigos, a termodinâmica evolui de uma ciência atrelada à mecânica para uma ciência ligada aos estados dos sistemas materiais e à sua mudança. Em 1874 Gibbs apresenta para a Academia de Ciências de Connecticut um esboço de um novo, ambicioso trabalho, que ninguém conseguiu entender. Mesmo assim a Academia financiou a publicação, em 1876, daquele que é considerado o maior trabalho de Gibbs. Um artigo maravilhoso, de 300 páginas e 700 equações, intitulado “On the equilibrium of heterogeneous substances”. Nele, Gibbs discute as propriedades de um “sistema” e suas condições de equilíbrio. Gibbs, busca extrair o máximo de conhecimento que se pode ter a respeito de um sistema, de forma independente da natureza do sistema. Isto é uma marca de Gibbs: o mínimo possível de hipóteses, o máximo possível de conclusões, a partir de generalizações de conhecimentos parciais. Gibbs vai além da descrição de sistemas isolados ou fechados, discutindo sistemas homogêneos e heterogêneos e introduz o conceito central da termodinâmica química: o conceito de potencial químico. Descreve o potencial químico como uma quantidade que, nas transformações e no equilíbrio químico, comporta-se de forma análoga a temperatura nas trocas e no equilíbrio térmico ou então ao da pressão nas movimentações macroscópicas do sistema e no equilíbrio mecânico. Tal como o calor se transfere espontaneamente de uma porção do sistema de maior temperatura para uma de menor temperatura, a matéria se transfere espontaneamente de uma porção do sistema com maior potencial químico para uma porção com menor potencial químico. Este conceito permitiu a Gibbs descrever quantitativamente a coexistência de fases da matéria, o equilíbrio de fases em substâncias simples e misturas, a termodinâmica das reações químicas, os limites de estabilidades do sistema, o estado crítico, o equilíbrio de sólidos sob tensão, os fenômenos de interface e capilaridade e o equilíbrio sob presença de forças eletromotivas. O grande artigo de Gibbs de 1876, fornece a base e a própria linguagem, de todas as formulações posteriores da termodinâmica química que estão presentes nos livros textos atuais de físico-química. Apesar de sua importância fundamental, o trabalho de Gibbs teve pouco reconhecimento imediato, e o reconhecimento que obteve na Europa foi graças ao empenho de Maxwell, na Inglaterra, de Ostwald, na Alemanha e de Le Chatelier, na França. Aos poucos, porém, o reconhecimento veio também na forma financeira (Gibbs passou a receber salário em 1880). Na década de 1880, Gibbs concentrou o seu interesse fortemente na matemática e foi o responsável pela notação atual do cálculo vetorial. Na década subseqüente, o seu esforço levou à construção dos pilares da Termodinâmica Estatística, uma ciência que explica as propriedades macroscópicas dos sistemas materiais com base no plano microscópico. A formulação da Termodinâmica Estatística prescinde de hipóteses detalhadas da natureza microscópica da matéria. É baseada na descrição estatística de um número imenso de sistemas independentes – chamados de Ensemble. Na formulação de Gibbs, o todo acaba sendo mais simples do que suas partes e, o comportamento médio dos Ensembles está relacionado com a Termodinâmica Macroscópica. A carreira científica de Gibbs foi interrompida com sua morte em 1903. Suas contribuições teóricas e novos conceitos na Físico-Química resultaram em inúmeras aplicações – desde a metalurgia até a biofísica, geologia, indústria química, tecnologia farmacêutica, nanotecnologia, eletroquímica, entre muitas outras. Mas o mais justo com sua memória é citar uma frase que Gibbs usou ao falar de Clausius, no obituário deste: “Seu verdadeiro monumento não está nas prateleiras das bibliotecas, mas nos pensamentos das pessoas e na história de mais de uma ciência”. J. W. Gibbs: Elementary Principles of Statistical Mechanics, Yale, 1901 (repr. Dover, New York, 1960. "His true monument lies not on the shelves of libraries, but in the thoughts of men, and in the history of more than one science" - I got a good quote today.Thanks. Yes, it is really a marvelous phrase! !